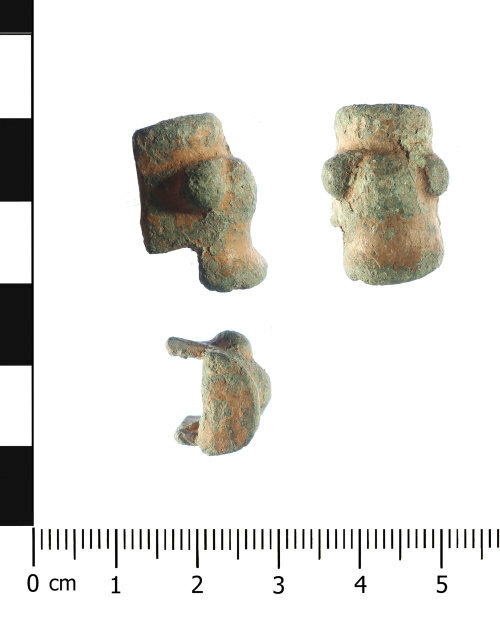 Probable Early Medieval (11th century) stirrup terminal: The copper alloy terminal is semi-cylindrical and the outer, convex face has moulded decoration in the form of three irregular large pellets at the mid point of the exterior. The lower edge is slightly flared, and on the reverse it is solid with a semi-circular section. The surface of the terminal is slightly abraded and has a matte mid green colour. The terminal measures 21.19mm long, 15.41mm wide, 12.37mm thick and weighs 10.3g. The stirrup terminal is probably an Anglo-Scandinavian artefact dating to the 11th century (Williams, 1997). This example is similar to those illustrated in Figure 5 (Williams, 1997).